Temple Grandin, a groundbreaking animal behaviorist, will receive an honorary degree from NC State. 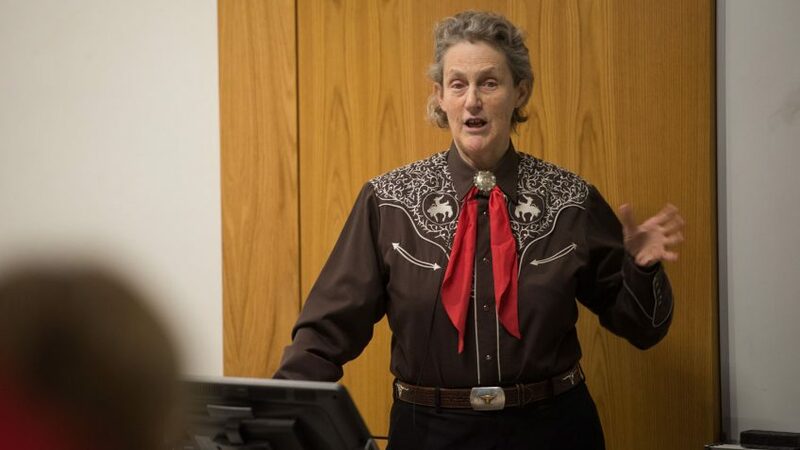 Temple Grandin, the groundbreaking animal behaviorist and frequent visitor to the NC State College of Veterinary Medicine, will receive an honorary degree from NC State during the university’s commencement on May 12. Grandin, who most recently spoke with CVM students during a visit last year, is a professor of animal science at Colorado State University. She was the subject of an acclaimed 2010 HBO biopic that covered her innovations in designing livestock facilities as well as her life with autism. Grandin is also a strong voice and advocate for those with autism spectrum disorder, especially children. Also receiving an honorary degree at the ceremony is Marian Wright Edelman, founder and president of the Children’s Defense Fund. Edelman will give the commencement address. Grandin’s honorary degree comes as the CVM seeks candidates for a new faculty position in global production animal welfare to be posted soon. The faculty member will likely work with local and international partners to modernize approaches to major public health and welfare issues, including food production and security, infectious disease and the intricate connection between animal and human wellbeing. For more information on the CVM’s dedication to global health issues, go here.